你好! I have officially been living and studying in Beijing for two weeks and have two more weeks to go! I have to admit that I can’t believe it’s already the third week, it really has flown by. I have looked forward to going to China for as long as I can remember and thanks to China Encounter it was made a reality. These weeks have been filled with fun and fascinating trips to popular tourist spots, restaurants, and “real Beijing” locations. My goal before coming to China was to really dive into Beijing. This is my first time travelling abroad and I really wanted to push myself out of my comfort zone. Whenever I am out and about in Beijing, I always think to myself “People, Places, and Food!”. 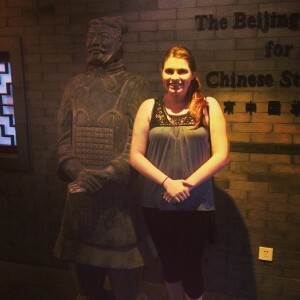 Yes, this thought may be broad, but whenever I get a little overwhelmed and a feeling of culture shock comes upon me, I remind myself that I want to learn, see, taste, and really enjoy everything relating to the Chinese culture. So far I believe I have succeeded! Although I wish I could spend all day discussing everything, I know that would make for a not so enthralling blog so I have decided to make a few entries with some of my favorite highlights. I will start off with one of my favorite food experiences. 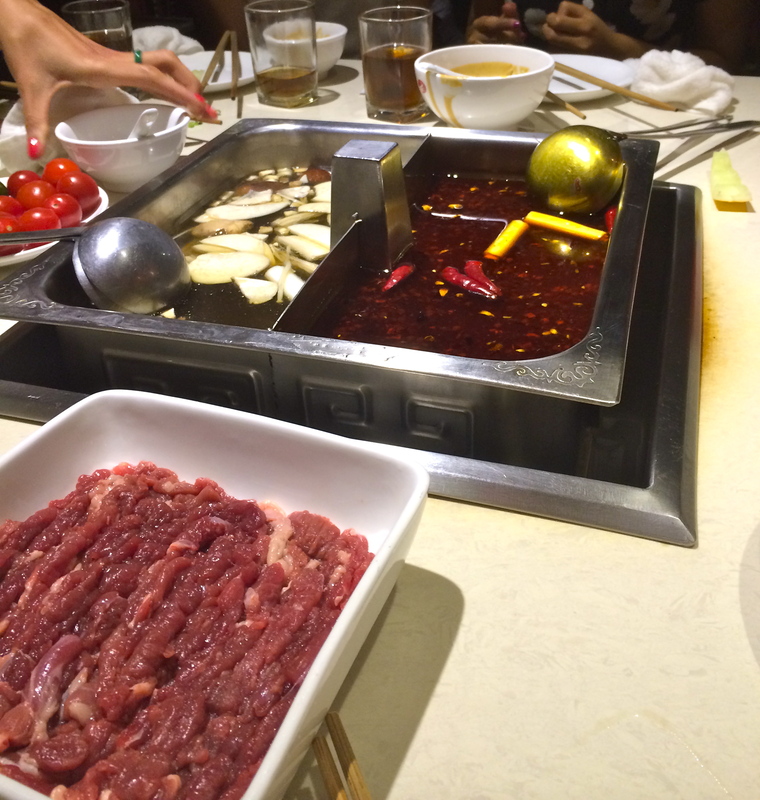 Food checklist: Peking Duck and Hot pot. In preparing for my arrival in Beijing I made a very small food checklist. Of course I knew I would try many different meals that I haven’t heard of, but Peking duck and hotpot were a must do, well actually a must eat. As of now I can check one item off the list: Hot pot! I will admit, I did have high expectations for hot pot, but this experience completely blew me away. Last week, a group of us headed to a hot pot restaurant a few blocks away from campus led by some UIBE Chinese students. I was excited but did not realize what would come next. The host greeted us at the door and took us up the elevator and into the restaurant. There was a room next to the restaurant, where guests were welcome to partake in FREE MANICURES! The service was top notch. We were even given aprons to wear and ziplock baggies to protect our phones.Two boiling pots of broth were placed in front of the twelve of us, and then we dug in. The assortment of food included: shrimp, beef, lamp, potatoes, noodles, tofu, and a few more items that were very tasty, although I am still not sure what they were. I definitely let my adventurous side take over. We all gathered around the pots cooking our food while being entertained by masked dancers and noodles throwers. This was definitely an experience I will never forget.